Does the full moon affect students’ behavior? Ask any teacher and you will get an earful of anecdotal stories. This once a month occurrence adds stress to teachers and administrators. Just look at the long line waiting to visit the principal on the next full moon. We know the dates of the full moons so why not plan a moon-themed activity? You could do this with your team or make it a school wide event. Planning something fun on this day might make your day a little less stressful. I recently finished a Sunshine Committee packet that includes a freebie in the preview file. How about moonpies in the teachers lounge and playing songs with moon in the title at lunch? The freebie includes a list of songs. 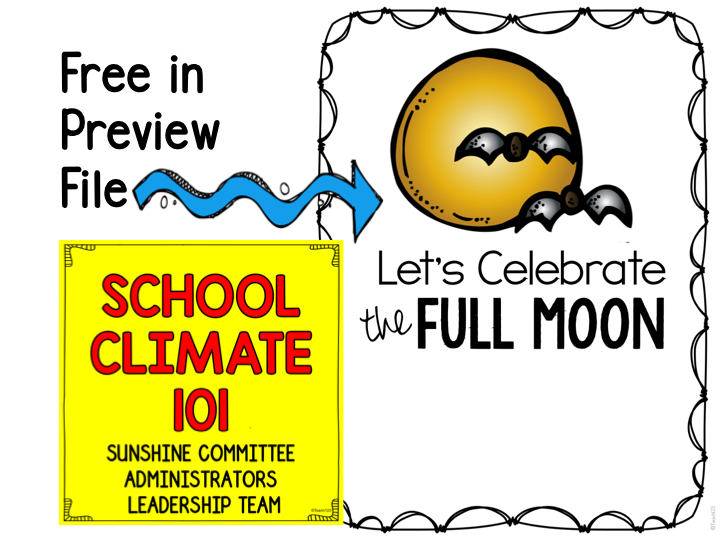 School Climate 101 has luncheon signs, signups, staff recognizing staff system, and other resources for administrators, Sunshine Committees, or other school leaders.